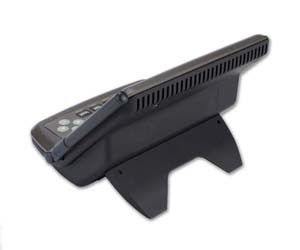 Can be used independently of the outdoor Vantage Vue Sensors for indoor only applications (not all features available). Barometric Pressure, Indoor Temperature and Indoor Humidity are shown simultaneously on one easy-to-read display. Great for home use or in greenhouses, wine cellars, and climate controlled computer/equipment rooms. A backlit LCD screen and glow-in-the-dark keypad make viewing data easy day or night. 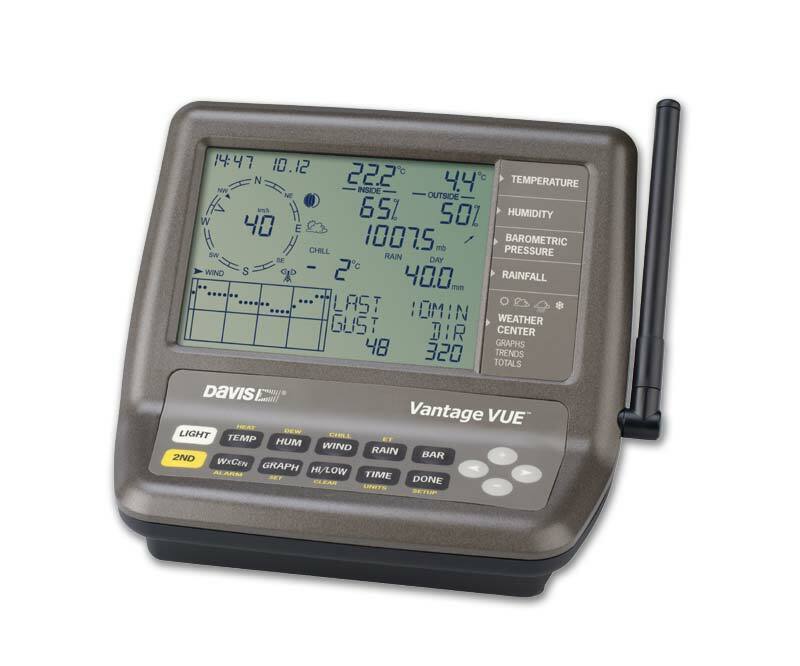 Can be expanded with a WeatherLink data logger, and WeatherView32 software. See VantageVue for more details. Can be used independently of the outdoor Vantage Vue Sensors for indoor only applications (not all features available). 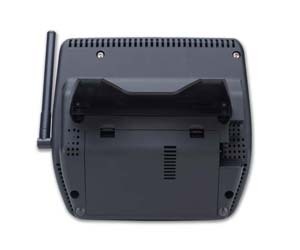 Barometric Pressure, Indoor Temperature and Indoor Humidity are shown simultaneously on one easy-to-read display. Great for home use or in greenhouses, wine cellars, and climate controlled computer/equipment rooms. A backlit LCD screen and glow-in-the-dark keypad make viewing data easy day or night. TIME & DATE: View the current time and date or time of sunrise/sunset. MOON PHASE: See the eight phases of the moon from new to full. FORECAST ICONS: Icons let you know to expect sun, part sun, clouds, rain, or snow. TEMPERATURE & HUMIDITY: Console updates outside temperature every 10 seconds and inside temperature every minute. In addition, outside humidity Updates every 50 seconds and inside humidity every minute. RETRANSMITS: Main console can extend range to additional consoles up to 1,000 ft. (300 m). BAROMETER: Five-position trend arrow shows whether barometric pressure is rising, falling, or stable. VARIABLE DISPLAY OPTIONS: See updated variables every 10 seconds for heat index and wind chill to get a better "feel" for the outside environment. RAIN: Console updates rain totals and rain rate every 20 seconds for the last 25 hours, days, months. "CHANGE IN WEATHER SINCE YESTERDAY" FEATURE: Allows comparisons of changes of temperature and barometric pressure from day to day. WEATHER CENTER: Weather Center provides additional information for each weather variable, such as daily highs and lows, temperature changes by the hour and barometric value changes. Also displays astronomical data such as meteor showers. USER-FRIENDLY KEYPAD: Domed buttons are easy to sense and press. Glow-in-the-dark keypad buttons give you access to weather information all day and all night. The Done key returns user to "current" screen from anywhere in the program. GRAPHS: Graph the last 25 hours, days or months. 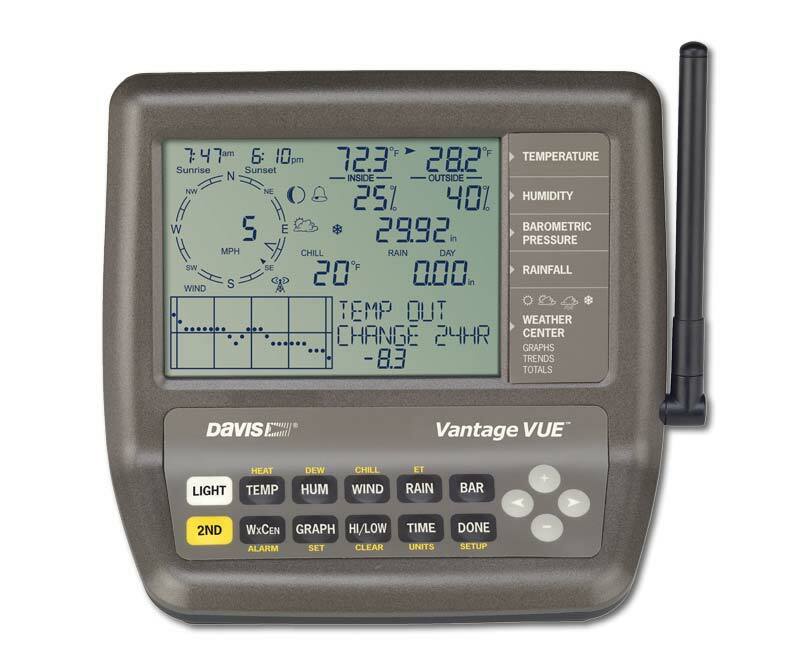 View up to 50 graphs including temperature, rain, rain rate, wind and barometric pressure—all on the console. "THIS TIME YESTERDAY" FEATURE: Data point on the graph indicates the weather during the same time yesterday to help compare and analyze day-to-day weather trends. ALARMS: Set 22 simultaneous, different alarms to warn of dangers such as high winds, freezing temperatures, rain rate, flood warning, and more. WIND SPEED: See windspeed updates every 2.5 seconds. Displays windspeed in miles per hour, meters per second, kilometers per hour and knots. Provides the average and high wind speed for two-minute and ten-minute intervals. 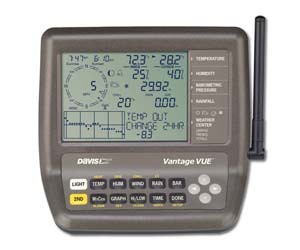 Can be expanded with a WeatherLink data logger, and Weather View 32 software.